In the whole debate we’ve been having in Toronto about street food, one thing seems to have been forgotten – that it should be not only delicious, but simple and easy to eat with the hands. 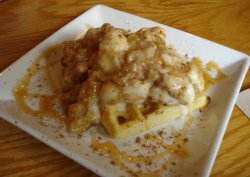 Local chefs are looking to countries in Asia and South America for inspiration for the dishes they’ll serve at the upcoming Street Treats Fair on July 13th, but there’s one country I’ve yet to have heard mentioned, one country completely overlooked. Poland. No doubt, readers are scratching their heads in an attempt to come up with any kind of Polish street food that isn’t kielbasa. Turns out, Polish street food has turned into café food, and a little space known as Zippie Café is turning out open-faced sandwiches known as Zippies. In Poland, the sandwich is known as “zapiekanka“, and is sold by street vendors throughout that country. Essentially it’s one half of a short baguette, topped with a variety of offerings and then toasted. At Zippie Café, it comes on a plate with a fork and knife, but they’re definitely available to go, complete with a little cardboard holder. Now, as an editor, I regularly “encourage” (that’s editorspeak for “throw a tantrum”) the writers here at Taste T.O. to try to cover as much of the menu as possible when writing a review so the reader has a better idea of exactly what is available and how it’s prepared. At Zippie, that’s an easy task, for the entire menu consists of four different Zippie sandwiches, a cereal bar that includes homemade granola, muffins and pastries, coffee and drinks (including Moscow-style coffee which supposedly puts Turkish coffee to shame), and a menu of ice cream-topped waffles. 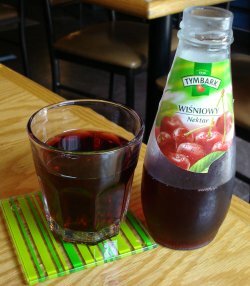 On a recent visit we ordered the Mushroom zippie ($4.85) as well as a Pomidorro ($3.99), and settled in with some Polish Tymbark juices ($1.49 each) in cherry and blackcurrant. While we waited, we watched owner Kasia Kuniec prepare the sandwiches. The space itself is a former antique/junk shop located in the strip of antique/junk shops immediately east of Roncesvalles. 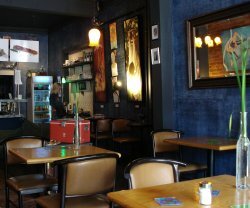 Walls are painted a dark blue and are patterned to look like denim, while the furniture is a mix of modern tables, comfy sofas and much-loved antiques. It’s a cozy space that is welcoming and unpretentious – it feels as though we’re in somebody’s house. The service reflects this warmth as Kuniec delivers our meals and ensures we’ve got plenty of napkins and cutlery. Yeah, this would definitely make great street food, despite the overflow of toppings that undoubtedly has to do with our hostess’s hospitality. 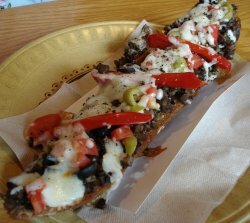 The mushroom zippie holds a thick layer of sautéed mushrooms topped with red peppers, olives and cheese. It’s damned hearty for a vegetarian sandwich, and these would be easy to get addicted to. 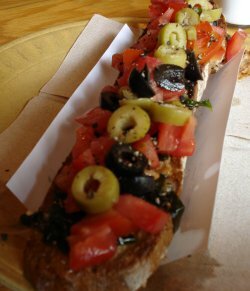 The Pomidorro is first toasted, then brushed with olive oil and topped with tomatoes and olives. It’s like a better version of bruschetta. Not content to just have a sandwich when there are sweets nearby, we opt to share one of the “deviliciously good” waffle sundaes ($6.66 each). With flavour options such as banana fudge, vanilla grahams, choco cherry and caramel fudge, the choice is difficult, but we ultimately settle on the apple graham – vanilla ice cream, apple pie filling and graham cracker crumbs. At one point I look up to see Kuniec behind the counter cutting up what looks like the apple pie filling and the ice cream – with a pastry cutter. Turns out, that’s exactly what she was doing. The result is less than pretty, but it works in terms of blending the flavours together perfectly. The presentation is a bit odd, but it means we get both apple and ice cream in every bite – it’s not a scoop of ice cream with the apples dumped on top. I can’t wait to come back and try another of these babies, which would also, incidentally, work as tasty street food.